The aircraft name Valetta is a corrupted title derived from the name Valletta, the capital city of the Maltese islands. The British had a way to alter a title of a place for their convenience of preferential pronunciation just like they did with the “Ta’Qali airfield” which they altered to “Ta’Kali airfield” to solve the phonetic pronunciation of the letter ‘Q’. How did the title Valetta originate? The origin comes from Gean Parisott de La Vallette. In late spring of 1565, the Turks under Sulieman ‘The Magnificent’ invaded the island of Malta, just off Sicily. La Vallette was the 72-year-old Grand Master of the Order at the time who fought in the battlements in the hot Mediterranean summer alongside his beloved knights of the Order of St John of Jerusalem, Knights Hospitalers. They were outnumbered, besieged, trapped by an enormous merciless, veteran Turkish Army. Sulieman knew, as did Adolf Hitler and Benito Mussolini; he could not control the Mediterranean Sea until he held Malta. In spite of the immeasurable might on the warrior-monks and the local inhabitant recruits, the Maltese and Knights emerged victorious after 5 months of continuous daily attacks, of never ending cannonade and prevented the Mediterranean from becoming their “private lake” of the Turkish armada. The Knights Hospitaliers and their men-at-arms and locals fought. Five hundred knights and 5,000 men-at-arms against 60,000 Turks…read the number over and over again. 30,000 Turks left dead…and this made an abrupt stop to the Turkish expansion into Europe. Spotting military aircraft in Malta was a haven if you lived in nearby towns like Hal-Luqa, and Il-Marsa etc. This was a time way back in the 60s. Even so you could always go and spend a couple of hours at the threshold of runway 024 or 06at Hal-Luqa airfield where you could log and take pictures of a wide variety of military aircraft that comes in to land or perform endless touch and goes. 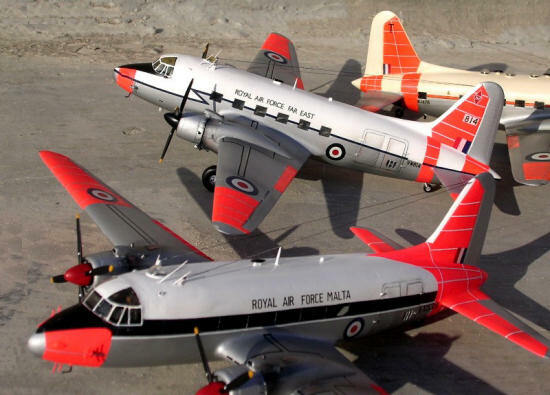 Most common among these were the local based aircraft like the Canberra PR7 and PR9, Shackleton IIs and IIIs, of 13, 39 and 38 Sq. respectively. Frequently common was the sight of a slow limbering twin-engine, white and silver aircraft that did not seem to appeal to anyone but with one exception and that was me. 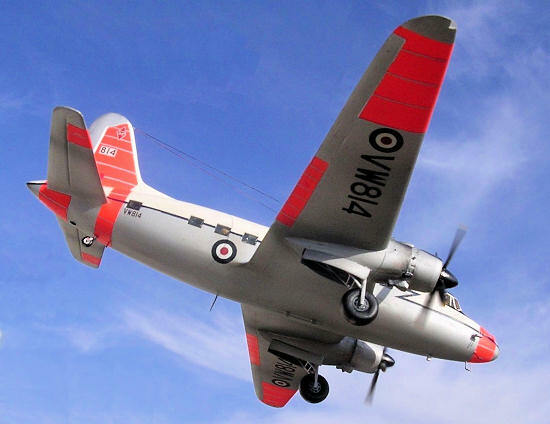 This aircraft was the Vickers Valetta C1, which was attached to the Malta Communication Flight. I always had respect for the Valetta and it offered such an attraction and fascination to me as it performed a variety of roles as trainer and transport aircraft and it was indeed a workhorse of the 50s and early 60s, particularly in the transport role performing duties like an unsung hero during wars as the Suez campaign and other skirmishes in the Far East, long before the arrival of the Hastings and Beverley. Before my time there used to be post war Wellingtons based at Hal Luqa and Hal Far. Understanding at the back of my mind that the Valetta emerged from the Wellington and the Wimpy my imagination at times used to take me to the point where in place of the Valetta I would picture a Wellington making circuit and bumps. 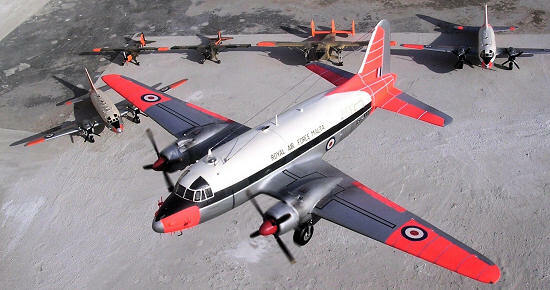 The twin-engine Valetta formed part of the Malta Communications and Target Towing Squadron. Valetta VW856 replaced VX539 and besides the Communications and VIP missions conducted by the squadron the Valetta was also equipped to carry loads externally as well as in the main cabin as one of the roles undertaken by the local type was that of Air Sea Rescue. During periods of stand by SAR these were usually of some 48 hours duration, Valetta VX539 carried two Lindholm dinghy containers under the forward fuselage external hard points. Other containers were carried within the main cabin together with smoke markers. Crew could eject the latter from fuselage and for which task the forward entrance door had been removed prior to take off. Valetta C1 VW856 tests were conducted to check the suitability of the Valetta in carrying externally the new Lindholm Mk3 equipment consisting of three containers, which were connected by a 600-yard long buoyant rope and was slung under the rear fuselage hard points. 17-6-64 WJ941 Boscombe Down. From Naples to Idris, Libya Along with Wessex XR588. 17-6-64 VX577 70 Sq. to UK on 19-6. 5-8-64 VX560 ferry to FEAF 52 Sq. 7-8-64 WJ498 ferry to Comm.Sq. 7-11-64 WJ504 C2 Met.com. Sq. 8-8-65 VW197 Met.Comm. Flt on loan to 70 Sq. 14-9-65 WJ462 T3 on loan to 70 Sq. VX574 C2 Malta Comm Flt. 26-9-65 VW197 loan to 70 Sq. 31-10-65 VW198 to 52 Sq. 10-12-65 VX577 C2. Met.Comm. Flt. VW810: Construction number 371. Type 651/1 first flew on 26-4-49 as VW810 delivered 31-5-49. Operated with 70 Sq. between 2-50 and 9-51 and 3-53 and 5-53. On 17-5-53 it crashed on take off from Luqa and was destroyed by fire. VX575: Construction number 427. Type 659/2. 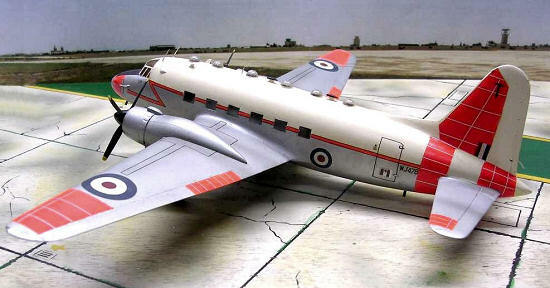 first flew on 10-11-49 as VX575, delivered 5-12-49, served with Malta Communication Flight 7-50 to 5-53 and 6-53 to 12-53. On 16-12-53 it crashed in a field at Qormi after taking off from runway 32 at Luqa. VX497: Construction number 443. 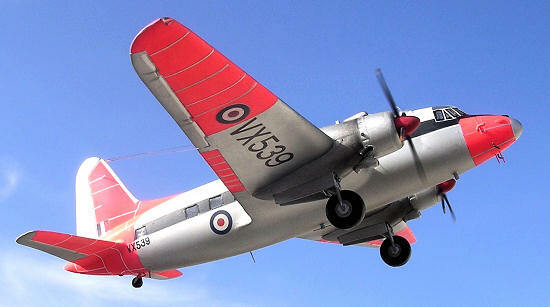 First flew on 16-1-50 as VX497, delivered on 24-2-50. On 26-4-50 it came to grief when it swung on take-off to avoid hitting man on runway and crashed.
. It is with regret to say that both of Malta based Valettas ended their life as fire fighting practice at Hal Safi at the end of their career and therefore none could survive for preservation by the Malta Aviation Museum, which at the time was at its stage of infancy. Modellers who have been in the hobby for some time are in no doubt familiar with vacform kits as those produced by Contrail, Rareplanes, Esoteric, and Aeroclub etc. 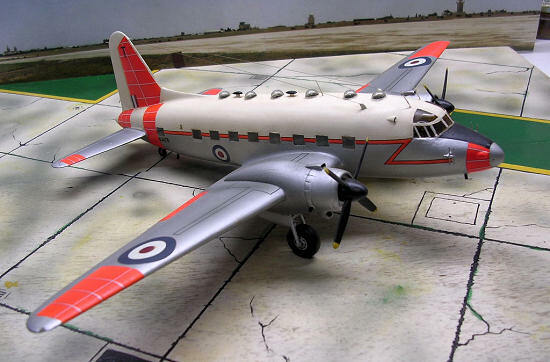 Vacform kits that have been around for some time are those produced by Airmodel, and who also happened to produce a reasonably priced vacform conversion kit of the Valetta which is intended to go with parts of the Airfix Wellington kit at a scale of 1/72. The kit comes in as one white polystyrene sheet, which contains the fuselage halves of the Valetta, tail planes and engine cowlings along an acetate clear sheet containing a perspex cockpit. In making a start on the Valetta kit one need to decide from early stage the version is to be made i.e. C1, T3 or a T4 which all have little variations between one and another. The first one I built was a T3 which was some time ago and more recently I decided on two C1s in view of the connections this have had with the local station flight when Malta offered facilities to the RAF at both ta’Qali and Hal-Luqa. Over the years I have accumulated a reasonable amount of reference material and photos so that I will be able to make scale models of the Valetta as accurate as I could. Nowadays the Valetta/|Viking is produced in injection moulded kit form but this did not alter my plans to utilise the vacform kits that I had in my stash and besides I do recommend this conversion even to the first time modeller who wants to start building vacform kits. Several parts from the Airfix Wellington bomber kit are suitable to use to make the Valetta. Basically these are the wing halves and the undercarriage parts. Modellers are therefore advised that the work involved in this conversion is within the ability of the average modeller who already has acquired the basic skill of plastic modelling if a successful result is to be achieved. I used to find that rubbing and filing down vacform parts as time consuming when I started my first vac form kit. This is not so today and care is always needed with every stage but each modeller will in due course develop his or her own technique. Having cut the two fuselage halves from the polystyrene by scoring the outline with a sharp modelling knife, the first task is to rub down the joint lines to ensure that a good match and fit can be achieved when the two halves are stuck together. I found that the best way to do this is to have a large sheet of wet and dry sanding paper placed with a small fold under the edge of a 1/2”thick x12”x 6” wooden flat piece. Double sided tape will achieve a good fit of these together. The next step is placing each of the fuselage halves on this sanding paper and starts rubbing backwards and forwards to obtain a satisfactory finish fairly quickly. The front engine nacelle parts, which are also supplied, are also dealt with in this way. The next step is to carefully mark with a pencil the series of rectangular windows and each corner is drilled using a 1/8 twist drill. The four corner holes are then cut with a sharp modelling knife until a series of square windows are produced all being equal is size and shape. To complete this first stage the cockpit is also cut and the finishing of this is left to a later stage. The cutting of the astrodome opening is left to a later stage i.e. when the two halves are already joined together. The interior to the cockpit as cabin floor, bulkhead, seating arrangement, instrument console and control columns and rudder pedals are also scratch built and added at this stage after reference to photos and drawings of this area. The layout is painted light grey with touches of black and dark brown seat cushioning. Interior of the VIP and /or freight area and floor are also painted at this stage. Intricate detail to this area is not recommended as the window panes are made of Kristal kleer which although is clear any detail added will be lost in the end. In the case of the T3 I have resorted to square cut clear Perspex windows. The pilot and co-pilot seat were made from scrap polystyrene sheet coming as backing sheet with the vacform parts. Strips from same source, which are about 3/16” wide, were added around the edge of the fuselage at alternate distance to each half. These will act as self-alignment and reinforce the parts when these are glued together. I found Humbrol liquid cement very effective to do the job and produce a strong bond. After the fuselage was allowed to dry out thoroughally, putty was applied to joint lines and other areas around the nose to obtain the correct contour or to fill up depressions and other surface imperfections that are normally present on this vacform kit as it is starting to show its age. Needless to say that constant reference is made to a selection of photos and scale plans that I had at my disposal. Using various grades of wet and dry sanding and reapplying body putty wherever needed I was able to obtain a much desired smooth round surface and in doing so completed the work satisfactorily. At this stage one will notice that the principal exterior difference between the T3 and the C1 version was that the T3 carried six astrodomes for use during navigation training while the C1 only had one astrodome used for observations. Therefore I simply had to accurately mark the position of these astrodome with respect to the version used and drilled 9/16” diameter holes. Frequent checks using a wooden stick of same diameter was used as ‘go/no go’ gauge in order to produce equal diameter holes. The astrodomes were made from acetate clear plastic that I accumulate from new shirt collar stiffeners and chocolate wrappings using male/female method and a small burner of the kitchen cooker. The mould male was made from the same 9/16 “d wooden male mentioned before with the end rounded with a smooth file to take a hemisphere shape. Eight astrodomes were needed to make the three models but I did make a few extra ones to replace lost or damaged ones. Using the Airfix Wellington parts 40, 41,37,38,36 and 39, one needed to do some alteration first. Each wing was assembled and a line was marked chord wise and ¼ from the wing tip from where the wing was parted using an exacto saw. The wing span was then measured so that the final overall span measures exactly14.87” or better still 7.44’from the centre-line of the fuselage. To simplify the accurate measurement of the span, a slot is cut at the wing root of the fuselage to take the locating flat pegs on the inner wing area. This will indicate that the new wing tips have to be about 1/4 “ inner in the wind and so this amount is cut from the sawn off wing tip before the tip is rejoined to produce a new wing. The trailing edge of the wing tip area is then faired gently using a smooth file to produce a corresponding smooth outline. The surface geodetic structure detail associated with the Wellington wing is also removed using a generous amount of wet and dry until this will disappear. New panel lines and elevator areas are then scribed using a sharp scriber, thin steel ruler and steady grip. The next stage is to produce a new set of tail planes. 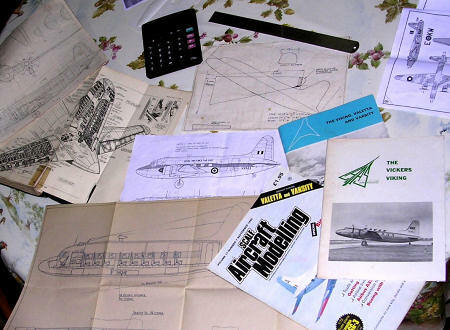 I have found that those produced by Airmodel conform to very early Viking design and match exactly with scale plans that I have coming from the March/April 1947, ‘Aeromodeller’ magazine. The other V aletta tail planes were much bigger in overall size using ‘Aviation News’ plans. Nevertheless these same parts were cut, sanded to correct section, joined together and were extended at the root end to bring to correct area after these got dry and sanded to shape. The tail planes were then drilled at the edge so that locating pins are added to assist to secure in place when joined to the rear fuselage. Be prepared however to carefully align the parts to correspond well with the tail section and these should be level when viewed from the front or rear. Putty is added to the root to produce the required small fillet by sanding to correct appearance. This in the end becomes a straightforward job in view that I had to repeat it three times in my case. Bearing in mind that the Airfix Wellington is some 50 years or so old kit I also noticed that the trailing edges needed trimming down the section to bring to a fine thinner edge. Fixing the main planes was simplified by first cutting a simple cardboard template in the shape of the lower surface of the wings looking from the front. This was made secure in a way so that it will stand on its own and the assembled model would rest on it while the glue is setting and at the same time giving the main planes the correct anhedral while drying for the next 24 hours. The joint area at the root was then given a coat of ‘Plasto’ body putty to produce a smooth fillet. 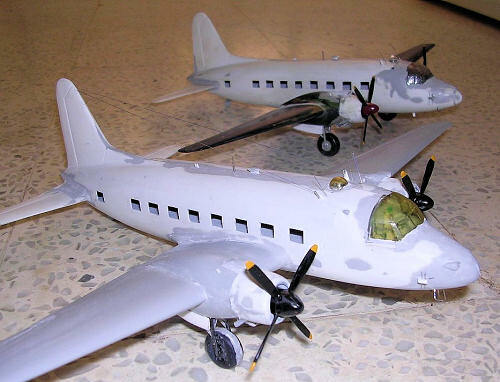 Airmodel suggests that that the engine cowlings and propellers come from an Airfix Bristol Super Freighter. 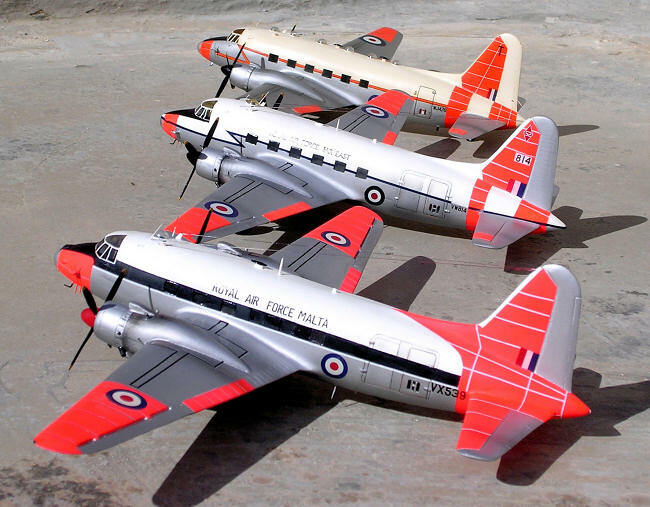 As I already have plans for two Freighters in RCAF and RNZAF scheme I decided not to spoil any of these and instead I have used the Airmodel kit cowlings, and the props and Spinners were on one of them obtained from the Aeroclub range of white metal props. These were very accurate in shape and outline and on the others I used scratch built ones using Contrail struts to produce the blades etc. For making the undercarriage, the following Airfix parts were used: 56, 57, 58, 59, 54, and 55. The difference being that the wheels needed to be thicker using plastic card spacers to bring this to correct dimension. Wheel well doors were also made from plastic card, which were bent to correct shape and cut to size. Part 72 was utilised as a tail wheel and detail added using stretch sprue parts. Fixing the clear acetate cockpit part was left to the final stage. This was first cut close to the size required using a pair of scissors and taking care not to initiate cracking to the rather thick clear Perspex. The next step was to trim the contact edges using a sharp trimming blade. A measured amount of putty was all that was needed to have a sturdy fit with a small amount of super glue added to the exterior joint surface away from the clear areas. Wing tip lights were cut at this very final stage. Small Perspex pieces were stuck in the space using super glue and when dry these were shaped with a smooth file followed by fine wet and dry. The final stage consisted of detailing the model/s. 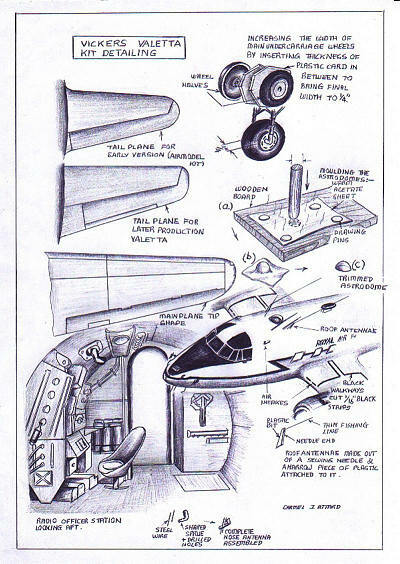 This comprised of reshaping the air intakes on the cabin roof and around the engine nacelles. The kit was then given a semi matt white overall finish and any imperfections that still remained which stood out were treated accordingly. Cockpit framing was carefully hand painted using a thin brush, around thin masking tape wherever this was required. 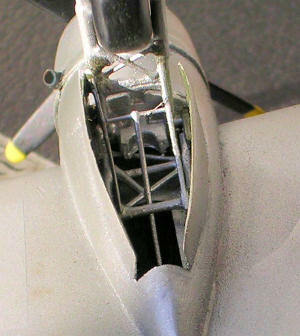 Tiny antennae around cockpit, door hinges, small fairings, wireless, and other detail to the undercarriage were also added. Each kit was given its respective colour scheme using Humbrol, Revell, and Modelmaster colours. I found that the local Hampel brand silver ideal for the metal finish. This was mixed with a tint of white and few drops of Revell clear satin varnish for best results. These were mixed well and thinned down to accommodate the airbrush extra fine nozzle. The list of those Valettas that at any one time served with the Malta CommunicationsSquadron is quite numerous. Other Valetta came as regular visitors during transit. 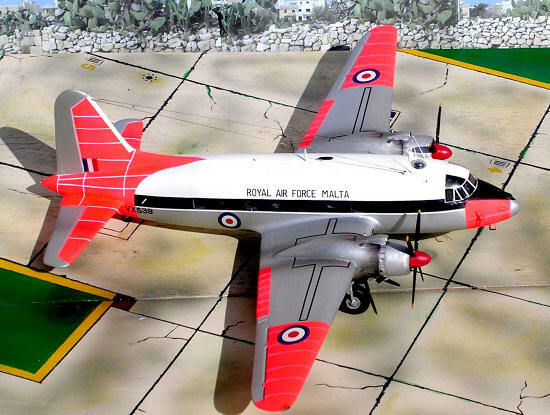 The three scale models of the immortal aircraft that I built all had some connection with Malta Either attached with the local station flight or came to Luqa airfield at some time as a welcome Visitor. from a Roodecal wording, “Royal Australian Air Force”, and adopting the lettering accordingly. The parting line between the Day-Glo panelling was produced by thin white and silver decal strips depending on the area where the Day-glo orange was. A fair amount of exhaust weathering was applied to all effluent areas and finally the wheel and anti glare areas were given a coat of matt varnish. 1) Valetta C1: VX539. No of production line at Weybridge 181 Construction number: 468 Type 561/1, first flew on 24-5-50 Served with the Malta C&TT Sqn 4-62 till 9-65. SOC: 28-2-66 used for fire fighting practice at Catterick. 3) Valetta VW814, Construction number 375 as Type 561/1. Served with Far East Comm. Sq 12-60 to 10-61 with 52 Sq codes 814. 10-61 to 6-62 and 12-64 to 4-66. Struck off charge 6-5-66. Visited Malta 16-12-64 while with 52 Sq ferry to Butterworth, Malaysia. The end result was quite pleasing and hopefully in not too distant future I should make an exception and add a civil aircraft type. An Autair or British Airways Viking using the same kit conversion and build procedure. 8 Information forwarded by R.Robinson of Fife, Scotland, about Malta based Valettas.